What’s better than winning the day at the Pokémon gym or capturing the ever elusive Pikachu? For Syntelli Solutions, it’s winning Power BI’s Spotlight Featured Story of the Month. 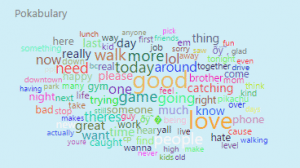 Syntelli’s data scientist team – made up of Matt Winter, Jayasri Akella and Hrishikesh Mukund – created this sentiment analysis on what people are saying about Pokémon across the United States. They dubbed it – what else? – Pokénation. “Matt’s report combined a fun and informative use of graphics with great data analysis that told a story about the sudden popularity of the game Pokémon Go,” said Jessica Cook, a Power BI Blogger in her email about Syntelli’s win. Which starter Pokémon did you choose in Pokémon GO? More than 43,000 tweets were analyzed for this dashboard and broken up into three sections: The Pokéball Popularity Map, the Emotion Ball, and the Pokabulary. 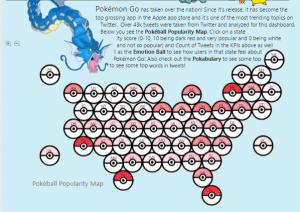 The Pokéball Popularity Map allows users to hover over and see how popular the game is in each state on a scale of zero to 10, 10 being dark red and very popular while zero is white and not so popular. New York feels the strongest about the mobile augmented reality game, averaging a sentiment score of 4.02. Montana had the lowest sentiment score with 0.02. You’d think with the beautiful outdoors in that state, more people would want to walk around and evolve their Pidgeys into Pidgeottos. 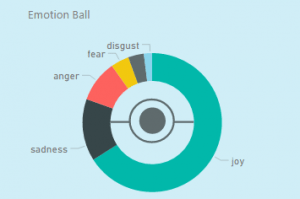 The Emotion Ball shows users how each state feels about Pokémon Go. When it came to gauging the specific emotions over all the states on Twitter, 66.31 percent of users expressed joy about the game. Anger came in at 9.22 percent, fear at 4.56 percent, surprise at 3.71 percent, and disgust at 2.44 percent. Pokabulary, a name that shows no restraint with fabulous puns, showed a word cloud of some of the most popular words people used to describe Pokémon Go. Among the most popular were good, one, catching, people, and today. The sentiment analysis was originally posted on July 28, 2016, and there have been new developments with Pokémon Go that continue to unfold. Now, users who are trying to use the game in the car will get a message saying they are going too fast and not to play and drive in the car. Plus, users need to be aware of civil trespass laws before playing the game. While the Syntelli data team used Pokémon in this sentiment analysis, they spearhead this type of information gathering for clients on a daily basis. Sentiment analysis can allow business owners to track their target audience more clearly. The same method can be used to track the social sentiment of customers, even how the company’s social media is affecting sales and interest in its products and services. Learn more about what sentiment analysis can do for your company with a quick demo — if you can get away from Pokémon Go long enough. Congratulations again to Matt, Jayasri, and Mukund!